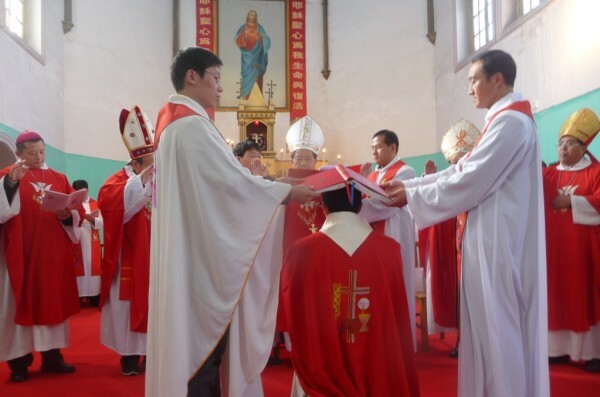 CHINA - VATICAN Assembly of Chinese Catholics "by the end of the year"
Assembly of Chinese Catholics "by the end of the year"
The Assembly is the sovereign and "democratic" body governing the Chinese Church. In his letter the Pope says that it is "incompatible" with Catholic faith and the Vatican advises against participation. So far it has been delayed owing to the resistance of many bishops. But many Chinese prelates fear retaliation against their pastoral work and funding for the work. Risk of division in the Church. Rome (AsiaNews) – Rumours are increasing that "by the end of the year”, and perhaps even by the end of November, the Beijing government will order the eighth meeting of the representatives of Chinese Catholics take place, a meeting that has been delayed for years due the resistance of many bishops. Months ago the Vatican had asked the bishops in communion with the Pope in China to avoid participation. Benedict XVI, in his Letter to Chinese Catholics, defines the organization and its principles as irreconcilable with the Catholic faith. AsiaNews sources in the capital say they are fearful that this meeting will lead to new tensions between the government and Catholic communities, others argue that the government is now forced to fix a date for the gathering, but "without much conviction." The National Assembly of Catholic Representatives is the highest authority that governs the Catholic Church in China. Its statutes define it as the "sovereign body". It is a "democratic" structure in which bishops are in the minority, joined by lay administrators and secretaries of the regional Patriotic Association. The body has the power to decide on national pastoral action, activities of the Church, Episcopal appointments, and even questions of theology. Its superiority to the bishops makes it incompatible with the doctrine of the Catholic Church. In fact, the Assembly is dominated by the Patriotic Association (PA), which has among its aims is to build a Catholic Church that is "independent" from the Holy See. For some time the PA has been trying to organize the Assembly to vote for a new president of the PA and the chairman of the council of Chinese bishops. The two posts have been vacant for years: since the Patriotic Bishop Michael Fu Tieshan, elected president of the PA in '98, died in 2007, and Mgr. Joseph Liu Yuanren, patriotic bishop of Nanjing, who was elected President of the Council of Bishops in 2004, died in 2005. In all these years, the gathering was always put off for "official" reasons. In 2008, it was for the earthquake and the Olympics in 2009 for the 60 years the People's Republic, in 2010 for the Expo in Shanghai. The real reason for this delay is in the fact the PA wanted to make sure that Ma Yinglin (patriotic bishop of Kunming, Yunnan), would be elected president of the PA. But the other real reason for the delay is the fact that many official bishops do not want to attend the meeting, since it is "incompatible" with Catholic faith. Thus the PA was unsure of its successful outcome. Matters came to a head however after the government apparently ordered the convening of the Assembly "by the end of the year." According to AsiaNews sources, the PA,in order to assert its power over the bishops and convene the Assembly, seems to have decided to withdraw the nomination of Ma Yinglin, and is even willing to accept two other candidates, Mgr. Joseph Li Shan, Archbishop of Beijing, or Mgr. John Fang Xinyao, bishop of Linyi (Shandong). Both prelates are in communion with the pope, even if they are considered quite weak in the face of government pressures. The PA had also planned a trip abroad for the few patriotic bishops not recognized by the Holy See, to prevent their participation in the meeting, which would embarrass the other prelates. Some months ago the Vatican Commission for the Church in China issued a statement asking the bishops tied to the Pope to avoid "to making gestures (such as, for example, sacraments, ordinations of bishops, attending meetings) that contradict their communion with the Pope. " The indication took some bishops by surprise, used to reconciling an inner loyalty to the pope and apparent loyalty to the PA. They complain that in this way, they risk being accused of being "unpatriotic" because they "love the Church (and the pope)." The slogan "aigua; aijiao" (love the Motherland, love the Church) is a slogan used by the PA to demand obedience to it, sowing the seeds of suspicion that if they love the Church and the pope then they automatically hate their country. Apparently, on October 27 last, the Vatican Commission for the Church in China, reiterated the line of advise to bishops not to attend the meeting. But some bishops are concerned that by not attending the meeting then they will become the target of the PA revenge, which could penalize pastoral work, cut funding for t work and - for some – perhaps even careers. In any case, the PA’s move to convene the meeting is likely to create division among those bishops who will participate, and the others who will refuse, thus weakening the Chinese Church.